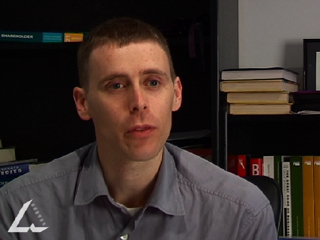 Video clip synopsis – Trevor Barr contrasts the privileged access to public television broadcasts with the free information exchange on the Internet. Stephen Mayne celebrates the value of ABC Online as a national resource and describes how activists have used the Internet to successfully broadcast their alternative views. Broadband MP4 cyberspace_bb.mp4 (10.7MB), suitable for iPods and computer downloads. These interviews with Trevor Barr and Stephen Mayne were recorded for the website From Wireless to Web, produced in 2005. Anyone with access to the Internet can become an author and 'broadcast’ ideas and opinions in a way that was never possible with the traditional media, especially the established broadcast media. Traditional broadcast media audiences – radio listeners and television viewers – experience 'the message’ as something delivered to them in finished form – in effect, a message 'done to them’. Now, by accessing the Internet, users can interact with 'messages’ by commenting, submitting feedback, engaging in a meaningful way with 'the message’. Most significantly, internet users can create their own 'messages’ for 'broadcast’. This radically changes the established order of things, the 'top-down’ model of communication that has dominated traditional broadcasting for more than 80 years. This new form of broadcast is a powerful tool that can be transmitted from a computer, mobile phone or PDA (personal device application) like a Palm Pilot or iPod. A message could include text (email, SMS or text file), images or moving pictures (video or animation), and audio. Messages in cyberspace can be accessed a number of ways, including via the Web (at a website), or by video stream, webcast or podcast. What sort of model is the traditional broadcast model? What are its characteristics? How have digital technologies changed this? What sort of broadcast from cyberspace do you use? Have you or someone you know created content? What do you think the implications for global democracy might there be in the new technologies. Who may be left out of this ‘global’ system?